Gareth Bale and Isco scored against Celta Vigo to give coach Zinedine Zidane a winning start on his return to Real Madrid. Isco, out of favour under previous coach Santiago Solari, made it 1-0 when he tapped in striker Karim Benzema's low cross from close range. And 13 minutes from time, Wales forward Bale scored Real's second when his low shot went in off the post. Real are now two points behind second-placed Atletico Madrid in La Liga. Diego Simeone's men lost 2-0 at Athletic Bilbao later on Saturday. League leaders Barcelona travel to Real Betis on Sunday (19:45). For Zidane and Real the rest of the season is about saving face after what has been, relatively speaking, a poor campaign for them. When the former midfielder quit 10 months ago, he did so after helping Los Blancos win three successive Champions League titles and the La Liga crown. It was a phenomenal achievement for the managerial rookie. The Spanish giants also owed a lot of that success to Cristiano Ronaldo, who has since left for Juventus. The comedown has been severe. Two managers sacked - Julen Lopetegui and Santiago Solari - and the Club World Cup as the club's only piece of silverware, sums up this campaign. The return of Zidane this week lifted the spirits of the fans, who on Saturday saw signs of the team who were so successful during his first stint. Midfielder Isco, attacking full-back Marcelo, Bale and keeper Keylor Navas found themselves recalled to the starting XI and took part in a display that was not 'vintage Zidane era' but was an improvement on recent performances. 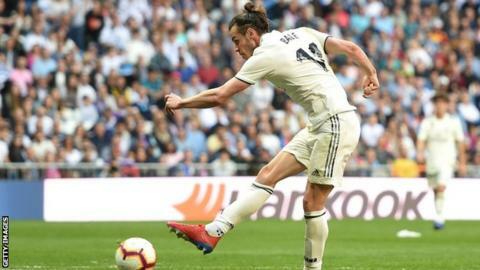 After Bale went close to scoring with a strike that came off the underside of the bar and Luka Modric had a goal disallowed for offside, Real finally broke Celta's final line of defence. The sparkling Marco Asensio laid the ball into the path of Benzema on the left. The French forward then delivered a pinpoint cross for Isco, who converted from a yard. Bale, the recipient of jeers from the home support in recent matches, received a huge cheer from a packed Bernabeu. However, it remains to be seen if he has a future under Zidane with whom he has previously had a strained relationship. Attempt missed. Toni Kroos (Real Madrid) right footed shot from outside the box is too high. Assisted by Marco Asensio. Attempt saved. Gareth Bale (Real Madrid) right footed shot from the centre of the box is saved in the centre of the goal. Assisted by Dani Ceballos.